As the weather warms in early spring, plants’ sap begins to rise and animals, including humans, stir slowly from the doldrums of inactivity due to weeks of gray, cold days. During this transition to warmer temperatures, gardeners often stroll among their still dormant vegetation to plan revisions to their gardens. 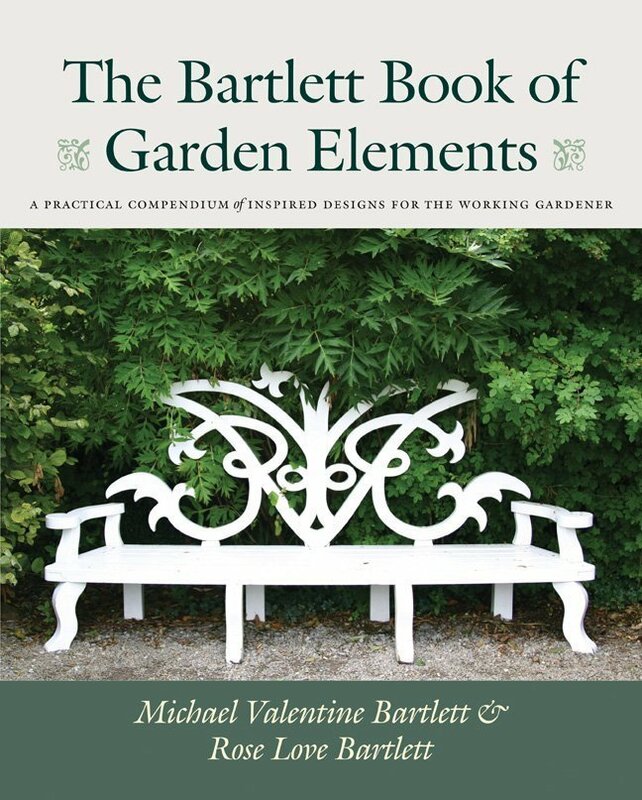 If you dream of new looks for your landscape, The Bartlett Book of Garden Elements (David R. Godine Pub., 2014) by Michael V. Bartlett and Rose L. Bartlett will definitely enlarge the possibilities of what a garden can attain in appearance. The authors, Michael and Rose Bartlett, are a perfect team. Michael, a landscape architect, designed the “bones” of projects incorporating such elements as pools, terraces, and major focal points while Rose, his wife and assistant, added the “flower, herb or container gardens.” They also took numerous photographs during their thirty years of visits to over a thousand gardens in 25 countries. While giving lectures to gardeners, the Bartletts were repeatedly asked to recommend a book to explain the various features of landscape design shown in their presentations. Their book fulfills this request for photographs of and information on garden elements from around the world. Each of the book’s 24 chapters discusses a specific type of garden element. An interesting history of the element’s uses and development begins each chapter. Sections on “Design,” ”Weathering,” and “Installation and Maintenance” are provided for each type of material used in an element, such as metal fences and wooden fences. Although their explanations of building and care requirements are detailed, the authors did not intend for this to be a “how to” book. They hoped to provide enough information to “allow gardeners to narrow down their options and make pleasing and practical choices” about the various elements presented for their consideration. Sections on arbors, birdhouses, drains, fences, furniture, gates, paving, stairs, porches and decks present examples that will appeal to all gardeners, no matter what their garden style or size. Although it is fascinating to gaze at the photographs provided of exquisite bridges, gazebos, pergolas, pools, ponds, sculpture, topiary and walls, these features would be a challenge to include in most small modern landscapes. The pleasure of visiting gardens without leaving home is part of the experience provided by the book. Each picture’s location is labeled, and no less than three photographs fill each page. This myriad of photos inspired me to add a simple bench to an empty space beside a raised bed in my garden. If, like me, you aspire to enhance your garden’s appeal, this book will furnish enough creative ideas to occupy you for season after season.